England, probably London or Canterbury, 1310-1320. Early 17th-century English gold-tooled brown morocco. Richard of Canterbury; William Cayser, seventeenth century; London, Sotheby's, July 27, 1907, lot 432; Bernard Quaritch Ltd., London; C.W. Dyson Perrins; his sale, London, Sotheby's, Dec. 9, 1958, lot 11; purchased there by Maggs Brothers Ltd., London for William S. Glazier (1907-1962), New York; deposited in the Pierpont Morgan Library by the Trustees of the William S. Glazier Collection in 1963. 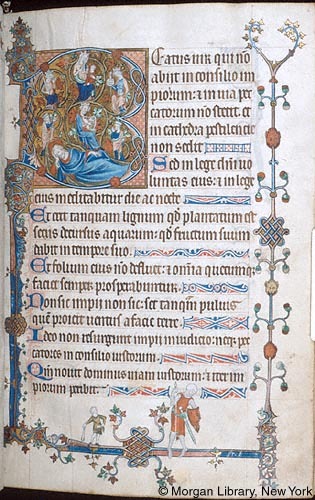 Ms. psalter, use of St. Augustine's Abbey, Canterbury, England (calendar, litany); written and illuminated in England, probably St. Augustine's Abbey, Canterbury, ca. 1310-1320. Decoration: 14 historiated initials with marginal extenders, some incorporating grotesques; 1 marginal historiation, numerous decorated initials. Artist: Master of Queen Mary's Psalter.